A slip and fall or a trip and fall refers to situations when someone slips, trips or falls as a result of a dangerous or hazardous condition on someone else's property. 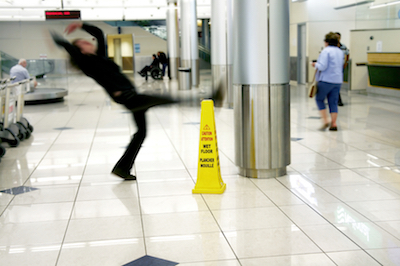 Slip and fall or a trip and fall are forms of premises liability cases. The Centers for Disease Control (CDC) categories slip and falls as either same-level falls or elevated falls. More than one million Americans suffer a slip and fall or trip and fall each year. Unintentional falls account for more than 19,500 deaths each year. While older people (for example those in nursing homes) are at great risk of falls, job related injuries account for 19 percent of disabling job injuries. Slip and falls or trip and falls are often the results of substances being left on the floor (water, wax and grease), defective stairs, escalators or elevators, missing or broken handrails, hidden hazards (loose floor boards, uneven pavement and potholes), items that have fallen on the floor, falling ceiling, falling products from shelves, defective sidewalks, poor or improper footwear, poor lighting, missing signage, uncovered cords or cables, clutter in walkway, poor housekeeping, and weather. In other instances, a slip, trip or fall may be the result of a lack of employee training or lack of safety procedures. Trip and falls can occur almost anywhere - stores, supermarkets, shopping malls, gyms, restaurants, bars, hotels, amusement parks, homes, apartment complexes, parking lots, sidewalks, in the work place, in private residences, and more. Thousands of people suffer an injury from falling every year. Slip and fall injuries can include bruises, factures and broken bones (ankles, wrist, arm, shoulders and hips), traumatic brain injuries, spinal cord injuries (paraplegia), and even a wrongful death. It is an owner's legal responsibility, whether a landowner, business, or private property owner, to keep their property free and safe from dangers. This includes all visitors, vendors, customers, and employees who visit their premises. If a property owner does not, they may be held liable and responsible for any injuries or deaths that occur on their property. If you've been injured due to a dangerous condition, or an owner or employee's negligence, you may be entitled to compensation. Injured victims must prove that the accident was caused by a dangerous condition on the property and that property owner knew of the dangerous condition and did not adequately fix or protect the victim from harm. Premises Liability attorney Tami Wolfe knows these case can be complex and difficult to prove. She has more than 20 years of experience to successfully litigate slip and fall cases. She represents clients throughout South Florida including Davie, Fort Lauderdale, Plantation, Weston and Sunrise. If you or a loved one has suffered injuries or death as a result of a slip and fall or trip and fall, contact Tami online or call her at (954) 791-0477 for a free consultation.